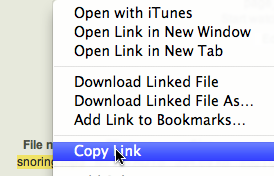 (3) A section will appear at the bottom of the page that has the link: Upload a file from your computer. Click on that link. (4) Another section will appear below that has a button that says Select Files. Click on that button and select the file from your computer. You may select several files, if needed. (5) When you're finished selecting files, click the Upload Files button. Then click the link to Refresh Files List. You should see your audio file appear under the list of files attached to the page. (7) Click on the Edit tab to edit your wiki page. What this text does is enable an audio player on your page, so that users can click a play button to listen to the file without leaving your page. (10) Save the wiki page and test out your new audio file.